One of the largest rivers in the state, the Kootenai River flows into Idaho’s northern tip from Montana, through Bonners Ferry and then exits the state on our northern border with Canada. Idaho’s 66 river miles consist of a wide, slow-moving 47-mile section from Porthill to Bonners Ferry and 19 canyon miles upstream from Bonners Ferry to Montana. Anglers can find rainbow trout, cutthroat trout, bull trout, brook trout and mountain whitefish. About 20 miles east into Montana is the Kootenai Falls, one of the largest undammed waterfalls in the Northwest. Parks, beaches and trails: The Kootenai is relatively inaccessible – making it a delightful destination for anglers or boaters who want to get off the beaten path. In Bonners Ferry there are public boat docks and a boat ramp. Just a few miles downstream from the town is the Kootenai National Wildlife Refuge, with an auto tour route and paths in the refuge alongside the river. 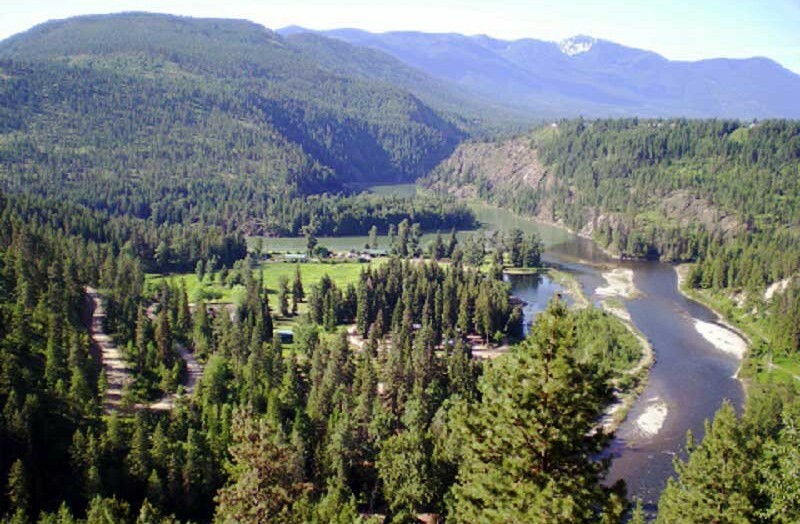 In the town of Moyie Springs, 8 miles upstream, is the best river access at the Twin Rivers Resort, located at the confluence with the Moyie River and now operated by the Kootenai Tribe with a new and ambitious sturgeon and burbot fishery. The resort offers camping, picnicking, swimming and just lounging. Boating: The river is navigable by motorboats along its length in Idaho. Downstream of Bonners Ferry the river meanders through the Kootenai Valley; most of the boating action is upstream in the scenic canyon. Rafters, canoeists and kayakers like this stretch; there’s no whitewater but advanced skills are advisable because the water is swift. River levels are controlled by the Libby Dam upstream in Montana, so boaters should be alert that river levels can rise or lower quickly. Wildlife: The river canyon provides a year round home to white tail deer with frequent visits by mule deer, elk, and moose. The Kootenai National Wildlife Refuge is a splendid destination for wildlife lovers, where literally thousands of migratory water fowl can be spotted in season as well as upland game birds, hundreds of song birds and other wildlife. Fishing: The Kootenai is notable for two fisheries of rare species, the white sturgeon and native Kootenai River burbot. The Kootenai Tribe has built a newly opened hatcher at Twin Rivers in the effort to restore these rare fish. For game fishermen, though the river provides good cutthroat and rainbow trout fishing as well as mountain whitefish and other species.